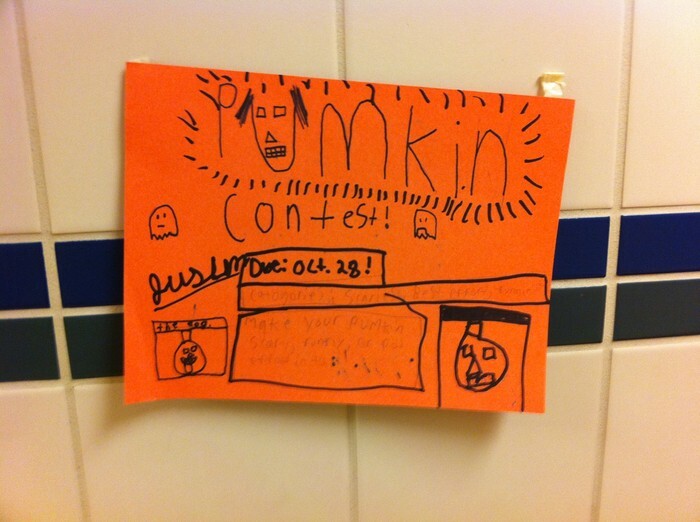 Did you see all the signs in the hallway about the pumpkin contest? 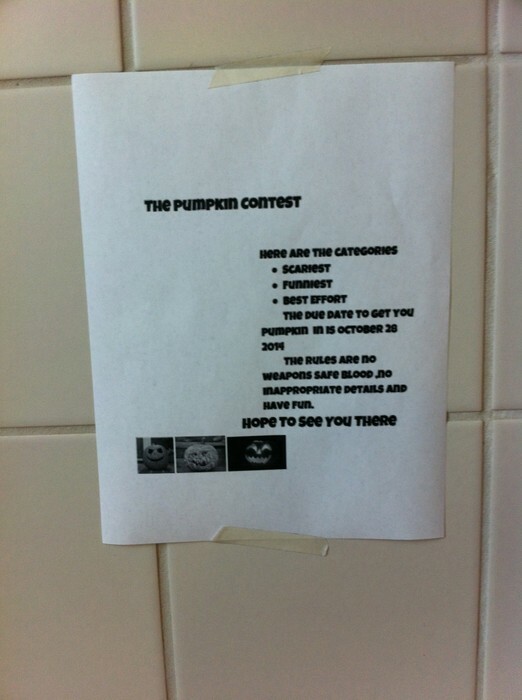 Well, I saw them and the pumpkin carving contest went great. 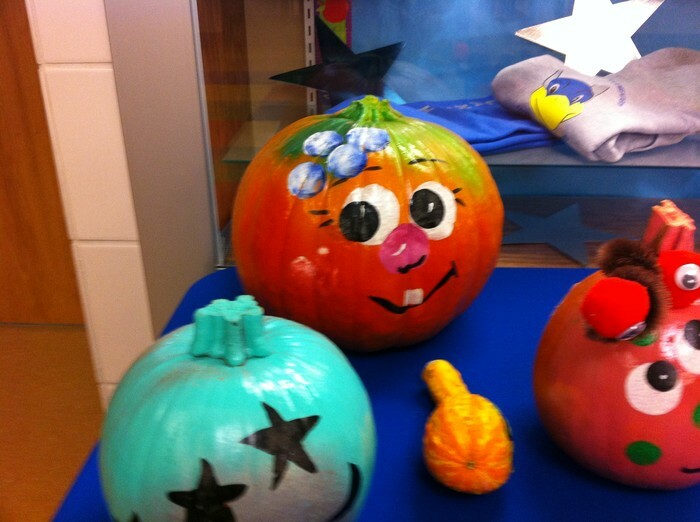 The pumpkin contest was made by the 5th graders and the 5th grade teachers. 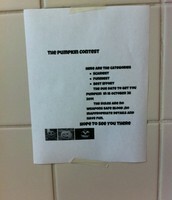 There were scary pumpkins, silly pumpkins, and serious pumpkins. AIl of the people that made pumpkins made them so good, and they put a lot of effort into them. Some of the pumpkins are in the lobby. If you go through the front doors there are two pumpkins there. 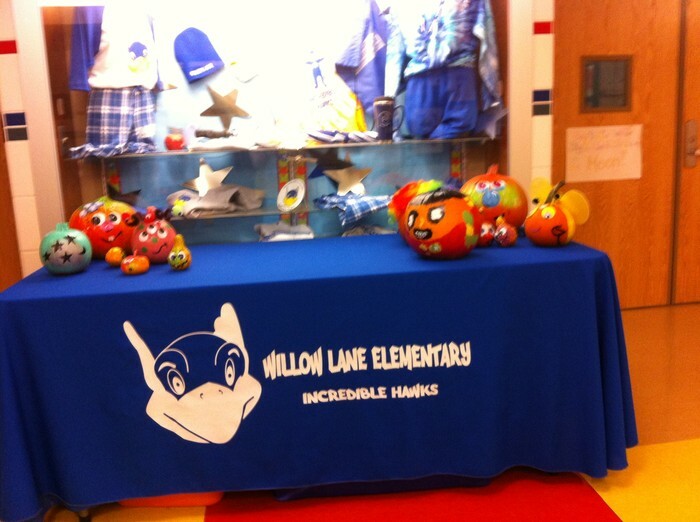 The pumpkins were brought into school the week of Halloween, and decorated classrooms all week. 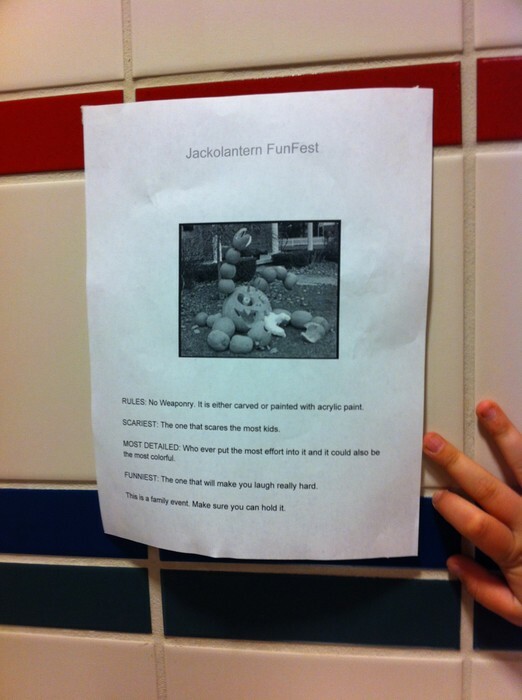 They were placed outside classrooms for fifth grade teachers to judge. The winners were announced on the intercom. Then the beautiful and scary pumpkins were brought outside to witness the costume parade. You should really check them out. What would cause a kindergartener to read a school newspaper? This is the question that prompted the following newspaper article. We thought about it, and came up with the following hypothesis: Kindergarteners would read the newspaper if their name was in it and it was about them. We then collected some responses from actual kindergarteners and Jack and Aaron said that they would both like to see their names and read about them. The same answer we thought they would say. We asked Arwen a kindergarten student, What subject do you like the most? Arwen responded, “Art, because it’s fun and I can use my imagination”. Jack replied, “Gym, because you get to run around.” Aaron also liked gym because they get to play games. This experiment will be concluded in the next newspaper edition, following a post interview of kindergarteners to find out if putting their names in the paper worked. 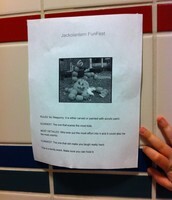 So, stay tuned for more Kindergarten News! 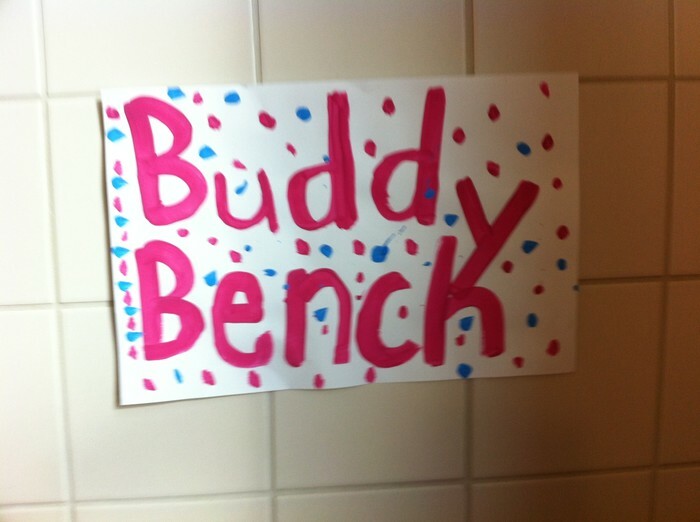 The buddy bench is a good place to find a friend when you don’t have a friend. 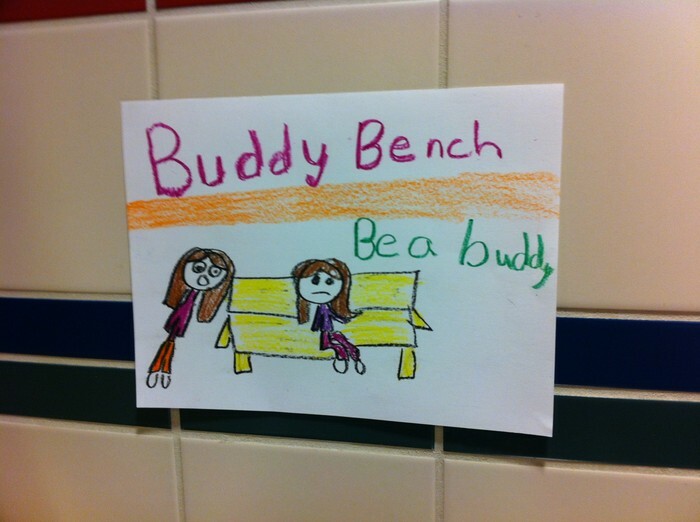 The buddy bench is not for playing.The buddy bench is there to help kids that don’t have a friend to play with. Maybe sometime someone will actually try to goof around. 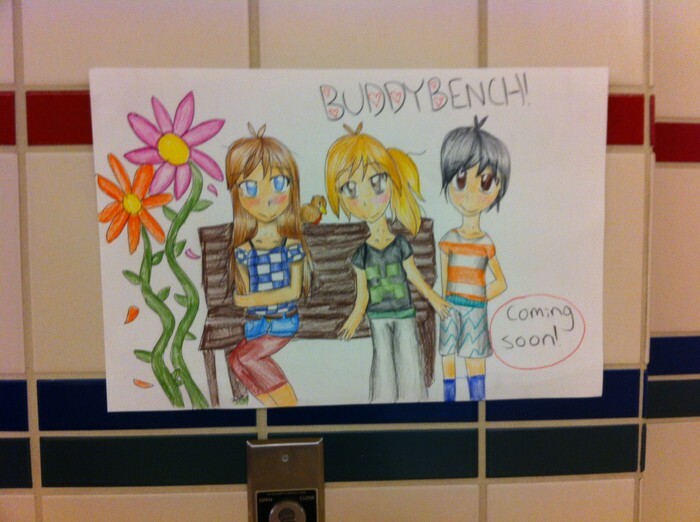 You should go over to them and tell them to stop goofing around and if they don’t listen go find an adult.If you see someone on the buddy bench should you help that person or should you not help that person? You should always help someone in need. Everyone needs a friend! Willow Lane honors a different teacher each week as “Teacher of the Week.” In addition to having his or her name called on the announcements, “Teachers get to park in a designated space that week,” said Dr. Moyer. In the past teachers were announced in the faculty news letter, but "I wanted a change," suggested Dr. Moyer. Every week my classmates and I would hold our breath as Dr. Moyer announced the teacher of the week. Finally, we heard it: “Mrs. Housten is teacher of the week.” We were super excited. The first week that Dr.Moyer started to announce the teacher of the week this year, my class heard that Mrs. E Martin, a fourth grade teacher here at Willow Lane was teacher of the week. My classmates and I all started cheering for her, because she is the teacher next to my homeroom. Teachers are special people, and I am glad we honor them in this way. It seems like the trout are so close but so far away! Test after test, Evan, a student of Mrs. Durigan, head of Trout in the Classroom, remembers the four tests that must be done. Those include, testing PH levels, nitrite, nitrate and ammonia. Tedious. As was mentioned during the marvelously performed skit in the fourth grade assembly, along with water tests the kids in Mrs. Durigan’s class need to count all the eggs to see if some have eyes. The ones with eyes are alive. There will be about 300 to count. 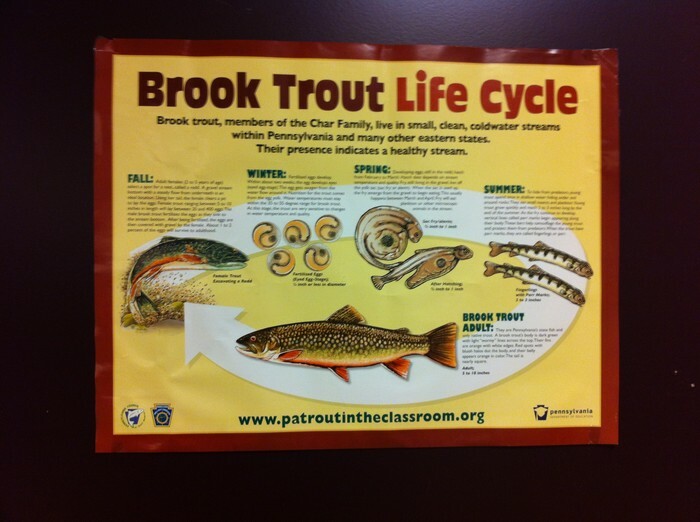 In short, there is a lot of preparation that goes into having trout in the classroom! The tank is covered up, you may be wondering “Why?”. Well my Willow Lane friends, this is to help the eggs stay cold, a necessary precaution for simulating the natural environment that the eggs would have experienced. The cover is made of painted foam to help the tank keep its cold temperature of 54 degrees Fahrenheit. 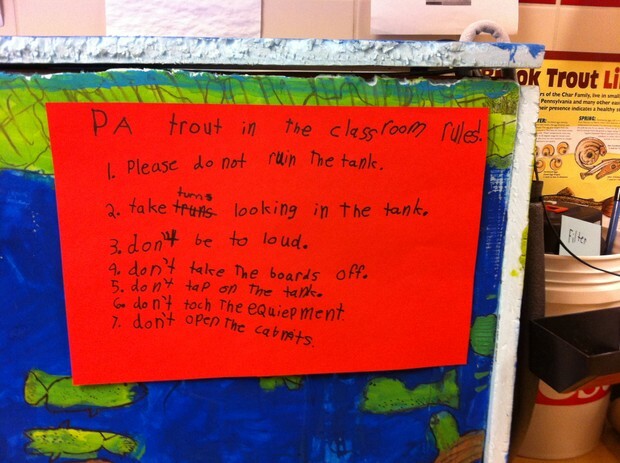 The reason it needs to stay cool is that Brook Trout lay their eggs in the winter so the tank needs to be cold so the eggs can grow. Also why it is covered is because it is dark under the river beds. We have interviewed the teacher who runs this project. The first question we asked her was, "Why did you start this project?" 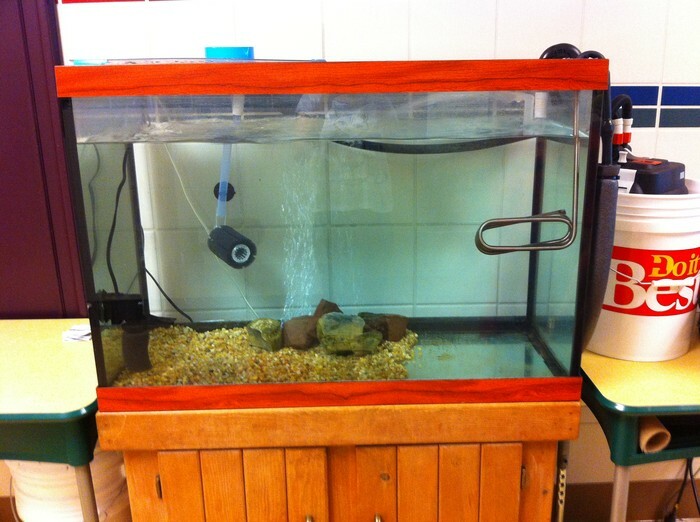 Mrs. Durigan responded by saying, “I just thought it would be a neat way for the kids to learn”. Why did you decide on this kind of trout? “Well, it is the state fish,” she responded. How did the kids feel when they found out about the project? “They were cheering and yelping. 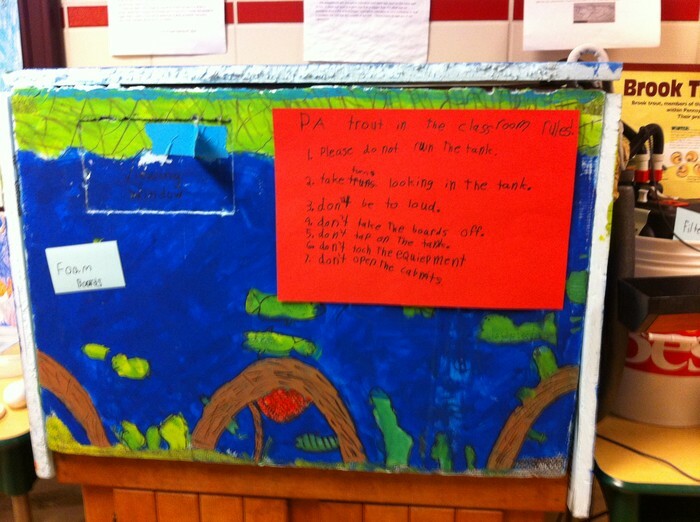 They were so excited and felt lucky to be able to do this project,” according to Mrs. Durigan. “Why are you ordering so many?” I asked puzzled. Finally, we had to leave, we thanked her for her time and left. Tune in next time for the kids inside view of their look on the trout! See ya later! The Newspaper Club is looking to begin featuring some new segments in future newspapers. We will be introducing a “Poetry Post”, “Comic Corner”, contests, and continuation stories. The Newspaper Club would like to invite Willow Lane students to begin submitting student-generated poetry and artwork. The best way to submit your work is to put it in a Google document, and share it with me (Mr. Weimann). You may also bring work by my room, 212, or have the office place it in my mailbox. But, the Google document venue is by far the easiest for me to manage. Please include your first and last name, as well as the name of your teacher. From what I understand, Lightning, the Incredible Hawk of Willow Lane, absolutely adores books. Of all the books at the Willow Lane Book Fair, what book would Lightning have to have? I have heard that Lightning was planning to visit Barnes and Noble on November 25th. What genre will draw his attention most, and why? I wonder what is the favorite genre of the other incredible hawks (all of the students) of Willow Lane. I feel a survey coming on! From the Willow Lane Newspaper Club, we hope you enjoyed our creation. We enjoyed making it for you, and would like to welcome you to join us with your own creative works. Happy reading and writing!